Two and a half months after a gas leak at the Aliso Canyon Storage Facility in the San Fernando Valley started, and still has not been stopped, California Gov. Jerry Brown has declared a state of emergency. Residents have long been complaining of illness, and thousands of people have relocated from the vicinity of Porter Ranch, California, located about 30 miles (48 kilometers) northwest of downtown Los Angeles. The Porter Ranch gas leak has been one of the worst disasters to hit Southern California in the past several decades, with its long-term outlook still unknown. Fumes from the leaking wells have caused many residents to complain about a range of illnesses including headaches, nosebleeds, nausea and dizziness. For many families living in the region, frustration over what they perceive as a slow response to the leak has turned into exasperation. “It’s the BP spill on land,” activist Erin Brockovich has said on CNN, and judging by the evidence, Brockovich is hardly exaggerating. According to the Environmental Defense Fund (EDF), one NGO taking the lead on monitoring the Porter Ranch gas leak, this disaster demonstrates why more oversight of natural gas storage facilities is needed. EDF claims that the Aliso Canyon Storage Facility, the largest such natural gas storage unit west of the Mississippi River, is spouting 62 million cubic feet (17.5 million cubic meters) of methane gas into the atmosphere each day. That methane gas, insist EDF activists, will have a massive impact on the regional environment. EDF has launched a digital counter that is tabulating the amount of gas the Aliso Canyon facility is leaking. EDF says the amount of gas leaked has the equivalent climate impact of driving 7 million cars a day. 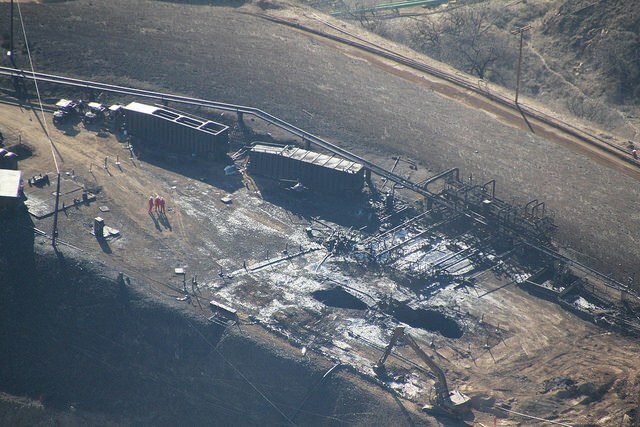 Meanwhile EDF has released photographs depicting the damage that has occurred at Aliso Canyon as well as photographs using technology that shows the size and breadth of the spill — which looks like an ongoing volcanic eruption. Southern California Gas Co., which owns the Aliso Canyon Storage Facility, has said repairs in the well will not be completed until February or March. The company stated that the leak emanates from 8,500 feet (3,000 meters) below ground and that two relief wells need to be drilled before the leak can be plugged. Brockovich, in a CNN interview, alleged part of the problem is that the well is old, dating back to the 1950s — and that Southern California Gas Co. never replaced a safety valve that was removed in 1979. The gas company was not moving fast enough for Gov. Brown, who has already been accused by Porter Ranch residents of not taking action sooner. Yesterday’s emergency orders require all state agencies to contribute any needed personnel, equipment and facilities to the effort to stop the well’s leak. Regulators will monitor Southern California Gas Co. to maximize its efforts to capture leaking gas and store it elsewhere. And in a move that suggests the gas company has not been transparent about the impacts of the Porter Ranch gas leak, Southern California Gas Co. will have to report on all of the company’s actions and reports related to the leak. The California Air Resources Board (CARB) will also have to develop a plan to mitigate the leak’s impact, which could have increased the state’s total methane emissions by 25 percent. Southern California Gas Co. will also be required to pay for the costs generated by the response to the leak, while ensuring ratepayers will be protected from any increase.